These wonderful papier-mâché anatomical models of bees were made around 1875 by Dr. Louis Thomas Jerôme Auzoux (1797-1880). 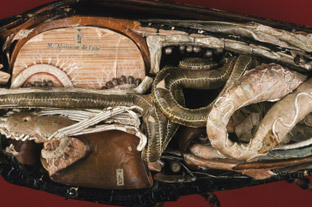 As a medical student in France in the early nineteenth-century, Auzoux was frustrated by the lack of real cadavers and the expense and delicacy of wax models to study anatomy. After his graduation from medical school in 1818, the entrepreneurial young doctor began experimenting with the creation of anatomical models, inspired by a visit to the papier-mâché workshop of Jean Francois Ameline in 1820. 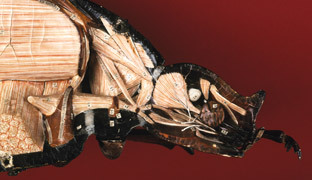 Taking his cue from puppet and doll-making techniques of the day, Auzoux developed his signature “Anatomie Clastique” approach: anatomical models made of a hardened paper paste, whose parts could be easily taken apart and reassembled. By 1825, the demand for Auzoux’s models had grown so much that he opened a small factory in Saint Aubin d’Ecrosville, which employed 100 workers by 1828. (Check out this great feature from the Zoology Museum at the University of Aberdeen for some wonderful images of the factory, molds and tools Auzoux used to create his models). Over the next century, Auzoux and his factory produced over 600 zoological and botanical models, including a range depicting human bodies and foetuses, but I think his over-sized bee and beetle models are particularly charming. 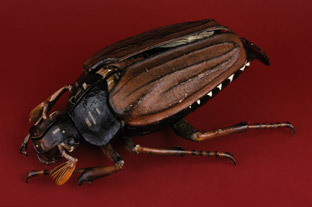 They are also astonishing in their detail: this model of a May beetle (made around 1850), for example, has hundreds of labelled anatomical details, and numbers to show the order in which its parts should be ‘dissected’. Although I know that these models were intended as educational tools, I think that they are also so delightfully playful: you can really see the influence of toy-making in Auzoux’s design approach. // Images via the teaching collection of Comparative Zoology at the Zentralinstitut der Humboldt-Universitat zu Berlin, the Whipple Collection and On A Lark. wow! what size are these? can’t be to life can it?